You may be thinking: I thought Johnny Cash played the guitar– why is he playing that odd-looking drum? That’s a conga drum, and it’s the musical instrument most associated with bandleader Desi Arnaz who starred with his wife Lucille Ball in I Love Lucy. 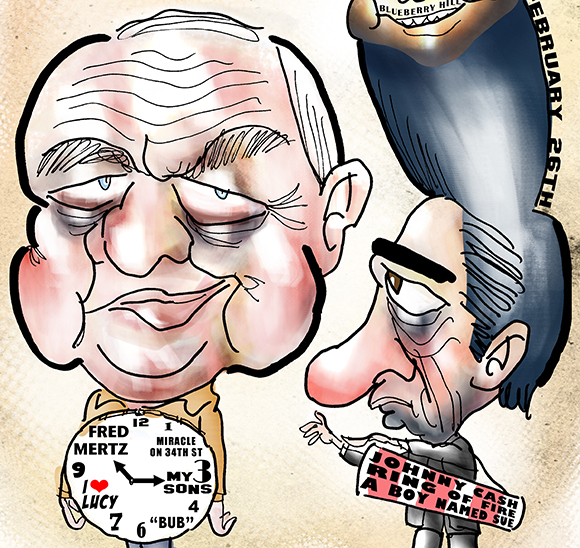 I decided to squeeze in an extra joke by having Johnny Cash stand in for Desi with his old pal Fred Mertz. These birthday tributes give me a chance to have some fun with type. 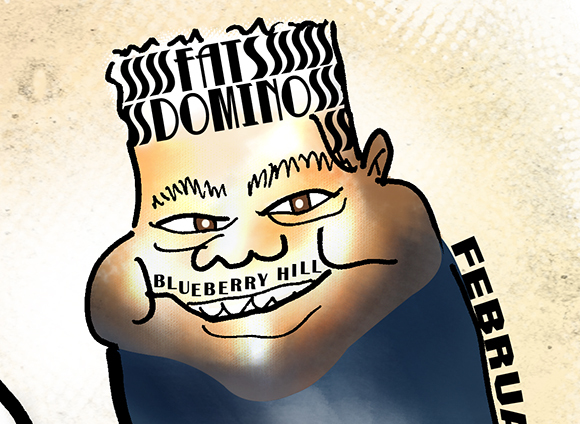 Here’s a close-up of my Fats Domino caricature. Fats always had a rather sparse moustache, giving me a chance to work in the title of his biggest hit. William Frawley had a long career as a movie character actor, almost always playing an irascible curmudgeon. One of my own personal favorite Frawley roles is in the Christmas movie Miracle On 34th Street. He plays a “political advisor” who tells a judge in no uncertain terms that his political career is over if he rules there is no Santa Claus. his pants fairly high, giving me an idea for where to place the birthday clock. Frawley played Fred Mertz from 1951 to 1960. He then played “Bub” O’Casey, the live-in grandfather and housekeeper for the first five seasons of My Three Sons, which starred Fred MacMurray as a widower raising three boys. Frawley and MacMurray had first worked together in a forgotten film called Car 99 way back in 1935. Here’s a scene from My Three Sons, along with a publicity shot for Car 99, which also starred a very young Ann Sheridan. Johnny Cash (d. 2003) is an undisputed country music legend. He was famous for performing free concerts in prisons, which led to hugely successful live recordings: At Folsom Prison (1968) and At San Quentin (1969) were both multi-platinum best-selling albums. Over time, he began wearing black for his stage performances, which led to his nickname, The Man In Black. His hit songs are too numerous to mention, but they included Ring Of Fire (#1 Country, #17 Pop, 1965) and the hugely successful A Boy Named Sue, a novelty song by Shel Silverstein (#1 Country, #2 Pop, #4 UK, 1968). 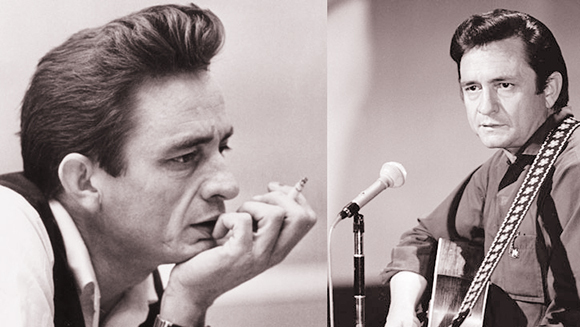 Cash wore his hair in a bit of a pompadour in his early rockabilly days (below, left). I thought it gave him a slight resemblance to Desi Arnaz which led to my conga drum joke. His hair got lower as he became an established country star (below, right). Fats Domino is primarily remembered today for one song: Blueberry Hill, which peaked at #2 on the Pop charts in 1956 (#1 R&B, #6 UK). That’s a pity because he racked up 37 Top 40 hits during a racially-segregated era when R&B (rhythm and blues) meant “black music,” and white artists like Pat Boone had greater success with milder versions of the same songs (Domino’s first Top 10 record, Ain’t That A Shame, peaked at #10; Boone took it to #1). Here’s the studio portrait of Fats that I based my caricature on, along with a shot showing the obvious joy and energy he brought to a live performance. Did our three birthday boys have anything in common besides February 26th? Incredibly, yes: they were all recording artists. I was astounded to learn in researching this post that Frawley had been an old song-and-dance man, and the first person to publicly perform some songs that were immensely popular in their day, including Melancholy Baby (1912) and Carolina In The Morning (1922). Frawley recorded an album of his old songs, Bill Frawley Sings The Old Ones, in 1958. Fred Mertz, crooner– amazing. What do you think? Why are certain cranky old curmudgeons so lovable? Think you’ll be adding any Bill Frawley songs to your iPod? Hope you’ll leave a comment. Great caricatures! I love Lucy! and all the rest. Thanks for the day’s bright spot. 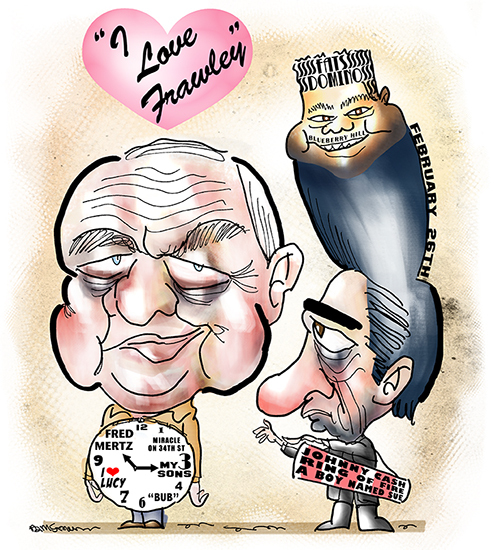 Did Frawley and Vivian Vance… (I think that was Ethel)… really hate each other? Thanks for your comment, really appreciate your stopping by! Ha! I have no idea how my mind works (there are mysteries too dark to plumb), but I did get pretty excited when I saw those three guys shared a birthday– something hadda be done! Thanks so much, TT, for that very lovely comment. Glad you enjoyed the post, always so nice to see you here. Cash has the best voice. I seem to remember him covering.an eerie song but now I can’t remember which one. Anyway, it was brilliant. I like certain curmudgeons because back then most people were serious, honest and worked hard. Well, there are still a few serious, honest, hard workers around. Like you and me, for example. OK, and Ives. She might be referring to Long Black Veil. Talk about eerie! I think you really captured the essence of William Frawley too! (and Johnny and Fats!) What fun it must be to be able to do that! 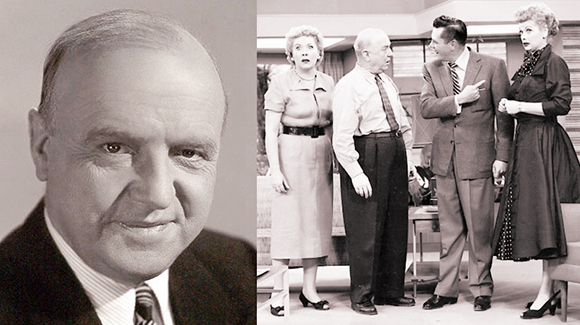 I think it’s interesting that William Frawley really didn’t change all that much from his role in Car 99 to his I Love Lucy days. Actually, I think I read he was 64 when he started I Love Lucy. And they all aged so much over the next 7 years, expect for William Frawley who looked about the same by the end of the I Love Lucy episodes. Thanks as always, Linda, for your very generous comment! The image is absolutely super. My favorite part is how you deftly wrangled Cash’s pompadour so it would turn into Fats Domino! Fred good, link good, everybody sing Babalu!! Bill Frawley was born to be a curmudgeon. In fact, I think he became one about two weeks after he was born. He wasted no time. It’s always fun to find common themes among people who share birthdays, celebrities and friends! Love the Fats Domino feel here, Mark. He was one of my favorites. And you’re right, I was surprised to hear about the Fred Mertz albums! Thanks, Sarah!– so kind of you to stop by. I, too, am always fascinated when certain people share a birthday– especially if they seem to be miles apart personality-wise, line-of-work-wise, etc. Seems like there should be some connecting link between them, but it’s probably just one of those tricky mental biases that psychologists are always catching us out on. I definitely did a wig-flip when I learned Frawley had recorded an album– Desi shoulda given him a conga drum and turned him loose in one of those ‘Lucy’ nightclub episodes!! Great to see you, thanks again!